What's most important is not which specific year is the warmest, but rather the continuing upward trend in global temperatures. That 2014 was not an El Niño year makes its high global temperature reading especially notable. 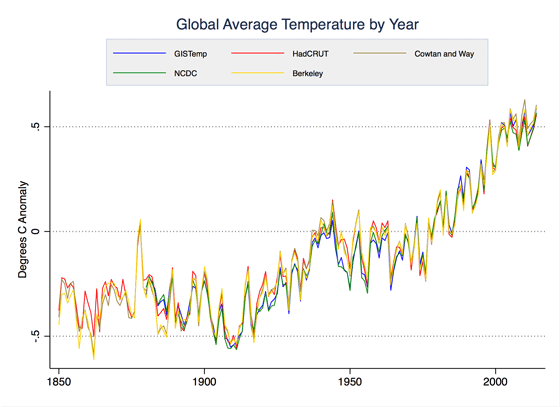 Reports by four different groups — NASA, NOAA, Japan’s Meteorological Agency, and Berkeley Earth — are in, and each indicates 2014’s global temperature appears to be the warmest on record since global temperature could first be calculated back in late 1800s. Reports by two more groups, the UK’s Hadley Centre and Cowtan and Way, expected to be released soon, likely will report 2014 as the second hottest year after 2010. In all cases, 2014 is effectively tied with 2010 and 2005 within the uncertainty of measurements. But in important ways, what matters most is not which specific calendar year — 2005, 2010, or 2014 — is the warmest, but rather the continued long-term warming trend, particularly given the absence of an El Niño in 2014. Temperatures have continued to warm over the past few decades, with seven of the hottest years on record occurring in the last 10 years, and nine of the hottest years on record occurring in the past 15 years. The past 15 years have been warmer than would be expected based on the trend in temperatures since 1970, but they also have been noticeably cooler than most climate models earlier had projected. Six groups currently report global temperatures surface temperatures. Four are governmental agencies, and two, Berkeley Earth and Cowtan and Way, independent academics. All have quite similar results over the past 150 years, with differences primarily based on the ocean temperature series used and the method of spatially interpolating data from individual stations to areas with no station coverage. In addition, two groups, UAH and RSS, report global lower atmospheric temperatures based on data from satellites. These tend to show a slightly lower warming trend than surface temperatures, and show 2014 as the third or sixth warmest year on record, respectively. 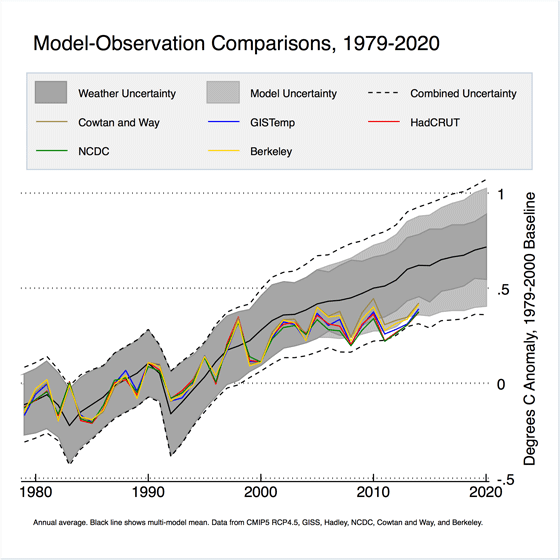 The figure below shows records from NASA’s GISTemp, NOAA’s NCDC, the UK’s Hadley Centre, Berkeley Earth, and Cowtan and Way. Degrees C anomaly relative to a 1961-1990 baseline. December temperatures are not yet available for Hadley and Cowtan and Way, so the annual average anomaly is used to infill the value for the time being. Their 2014 annual anomaly may change slightly once December values are available. NASA and NOAA tried to assess the statistical likelihood that 2014 is the hottest year on record, and their results, based on a method outlined in this paper, are shown in the table below. In both cases, 2014 is more likely than any other year to be the warmest year on record; but at the same time 2014 — and this is counterintuitive — is less than a safe bet to be the warmest year on record. The reason? The probability that 2014 is the warmest year is less than 50 percent. But whether 2014, 2010, or 2005 is the warmest year in the end is somewhat immaterial. What really matters for understanding changing climate is the long-term trend, which is strongly upwards over the past 150 years, and particularly over the past 50 years. 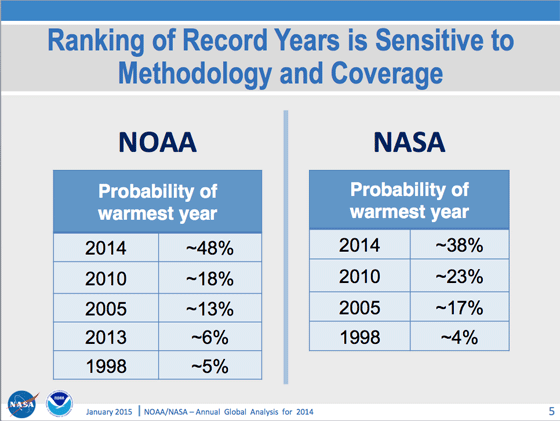 Figure via the NOAA/NASA press conference. What is particularly notable about 2014 is that it was potentially the hottest year on record despite not being a strong El Niño year. El Niño, part of a cycle of warm and cold Pacific Ocean temperatures every five or so years, tends to be associated with warmer global temperatures, with its counterpart, La Niña, associated with colder temperatures. There is no universal definition of what an El Niño year actually is, as global temperatures tend to lag the development of an El Niño by a few months. NASA scientist Gavin Schmidt says he thinks the best definition is based on the El Niño status during the final three months, October through December, of the prior year. Using this definition, most other recent record-warm years were also El Niño years, as shown in the figure below from NASA. The main reason satellite records did not find 2014 to be the hottest year on record was that satellite records tend to amplify the effect of El Niños compared to surface temperature records. 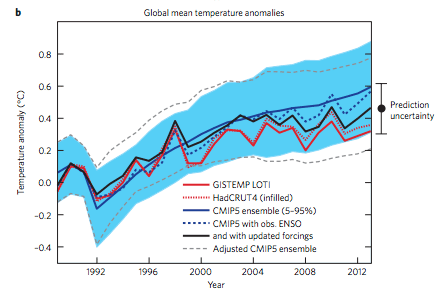 Figure shows data from GISTemp and is taken from NASA’s Earth Observatory. Despite much discussion of a “hiatus” in warming in recent years, it is clear that global temperatures continue to be among the warmest ever recorded. The past 15 years have actually increased the temperature trend compared with the rest of the years in what the IPCC refers to as the “modern warming period” (1970 to present). 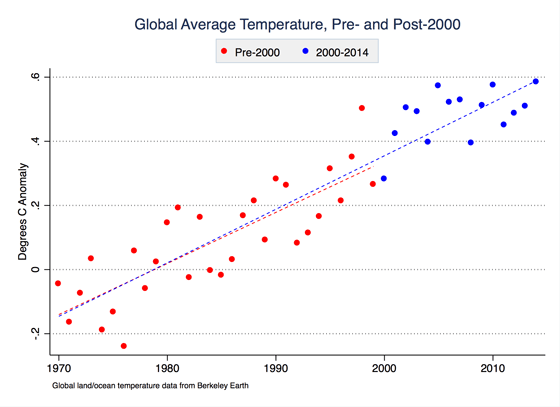 As shown in the figure below, temperatures from 2000 to 2014 have been warmer than had been expected given the long-term temperature trend from 1970 to 1999. While the trend over the past decade is fairly flat, there is a danger in over-interpreting short-term trends in long and noisy time series, as this illustration shows. Despite record warmth over the past decade, global temperatures have remained on the low side of predictions from climate models in the latest IPCC report (known as the CMIP5 models). While temperatures have stayed within the 95 percent confidence intervals of the models, they are well below the average, as shown in the figure below. This discrepancy has led some to question whether the climate might be less sensitive to carbon dioxide than previously thought, or to question whether climate models are getting some things wrong. While its too early to know for sure, climate scientists have been looking at many different possible explanations for these discrepancies. One of the more compelling arguments comes from a paper published in Nature Geosciences early last year by a team of scientists from NASA. They found that all climate models from the most recent IPCC report had used the same set of “climate forcings” (e.g., future scenarios for CO2 emissions, solar cycles, etc.) as inputs, and that these forcings were systemically off for the period from 2000 to 2013. Effects of volcanoes in recent years had been underestimated. When these factors are corrected, and when El Niño cycles are accounted for, the model average is much closer to observed temperature data as shown in the figure below. Figure from Schmidt et al 2014. Authors of another study, published in Nature in 2013, suggest that cooling resulting from natural variability in the Pacific was not captured well, accounting for much of the divergence. These researchers suggest that this effect will dissipate in coming years, and that temperatures will increase accordingly. Record temperatures in 2014 reinforce a long-term warming trend, and suggest that the “hiatus” in temperatures that has received so much attention in recent years will prove to be a temporary blip on an upward warming trend. This growing divergence between climate models and observations is in many ways the more important, and more interesting, point. While there are a number of potential explanations, observations of Earth’s climate and climate forcings over the next few years will help scientists determine the best explanations.